Abstract — Knowledge of how persons with amputation use their prostheses and how this use changes over time may facilitate effective rehabilitation practices and enhance understanding of prosthesis functionality. Perpetual monitoring and classification of prosthesis use may also increase the health and quality of life for prosthetic users. Existing monitoring and classification systems are often limited in that they require the subject to manipulate the sensor (e.g., attach, remove, or reset a sensor), record data over relatively short time periods, and/or classify a limited number of activities and body postures of interest. 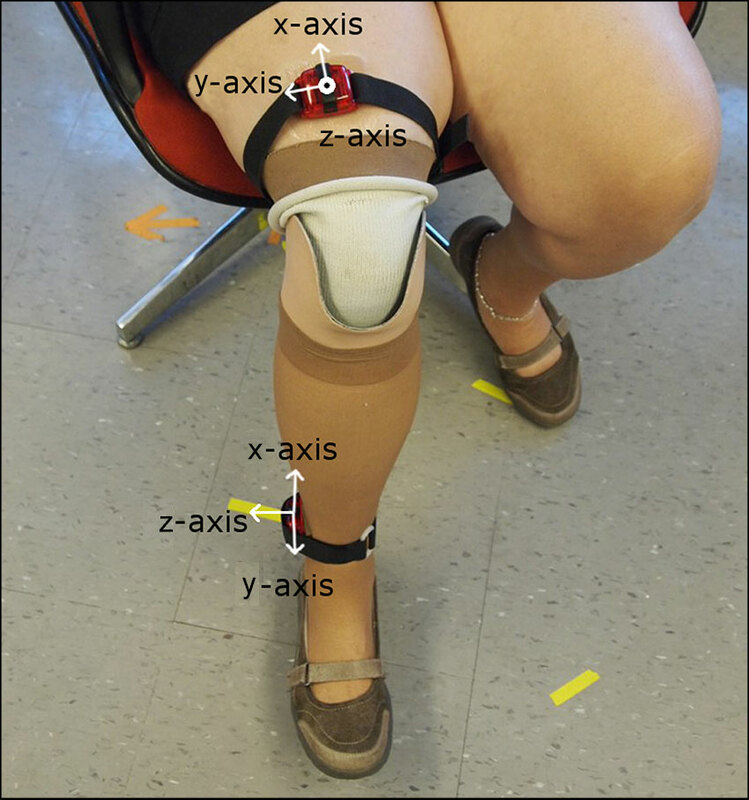 In this study, a commercially available three-axis accelerometer (ActiLife ActiGraph GT3X+) was used to characterize the activities and body postures of individuals with transtibial amputation. Accelerometers were mounted on prosthetic pylons of 10 persons with transtibial amputation as they performed a preset routine of actions. Accelerometer data was postprocessed using a binary decision tree to identify when the prosthesis was being worn and to classify periods of use as movement (i.e., leg motion such as walking or stair climbing), standing (i.e., standing upright with limited leg motion), or sitting (i.e., seated with limited leg motion). Classifications were compared to visual observation by study researchers. The classifier achieved a mean +/– standard deviation accuracy of 96.6% +/– 3.0%. Key words: accelerometry, activity/posture classification, activity monitor, ambulatory monitoring, amputees, artificial limbs, prosthesis, prosthesis use, rehabilitation, transtibial amputation. Abbreviations: BDT = binary decision tree, g = gravitational acceleration, MFCL = Medicare Functional Classification Level, SD = standard deviation, SMA = signal magnitude area. Prosthetists, physicians, and prosthetics researchers are challenged to describe how persons with limb loss use their prostheses outside the clinic or laboratory . Performance tests such as the timed up and go test  or the 6 min walk  can be used to measure mobility of a prosthetic user in a clinic or laboratory [4–5], but information on what prosthesis users do in their daily lives can be difficult to acquire. Characterizing ways that prostheses are used is complicated by the range of situations and environments users encounter. The characterization of prosthesis use could be partially achieved by quantifying prosthetic wear (e.g., donning and doffing) and users– engagement in locomotor activities (e.g., walking and stair climbing) and fundamental body postures (e.g., standing or sitting). Accurate knowledge of prosthetic use in free-living conditions would enhance prosthetic prescriptions, fitting processes, and outcomes measurement . Previous methods for measuring prosthetic use outside of a gait laboratory or clinic included self-report surveys and personal activity monitoring devices (e.g., pedometers and step activity monitors). Self-report surveys have been used to quantify frequency and duration of prosthetic use . However, self-report of activity among persons with limb loss has been noted to be unreliable when compared with a step activity monitor . Pedometers and step counters have been used to objectively measure step activity of persons wearing prostheses over extended periods of time [6,8–13]. While these sensors accurately measure gait activities, they are unable to provide information about body postures that may also be part of a person's habitual activity . Differentiation of body postures may be clinically important as sitting and standing can affect changes in residual limb volume and alter the fit of a prosthesis [15–16]. Accurate knowledge of how much a prosthetic user sits or stands could thus be useful in determining changes in socket fit throughout the day. Identification of activities and postures has previously been achieved through classification of data from one or more body-mounted sensors [14,17–20]. This technique has been applied to characterize the quality of gait , discriminate activity levels , and determine body orientations  of individuals without amputations. It has also been used on persons with lower-limb amputations to quantify step counts , estimate ambulation time , and describe gait patterns . Algorithms have also been developed to identify locomotion and posture of individuals with an amputation from sensor data obtained over short time periods (i.e., up to several hours) [10,26–28]. While these studies demonstrate potential for activity and posture classification based on data from body-mounted sensors, there remain challenges to clinical use such as need for multiple sensors, subject donning requirements, low storage capacities, and short battery lives. Currently, available sensors are also often restricted to short-term applications and/or require adherence to specific user protocols. Accordingly, more user-friendly and clinically relevant solutions are needed to overcome these challenges. Here, we explore the potential for a commercially available accelerometer and custom signal processing algorithm to identify when prostheses are being worn and to classify periods of use as movement, standing, or sitting. Use of a single sensor mounted to a prosthesis would eliminate the need for the user to attach and remove the sensor, improve wear compliance, and reduce cost. We believe this strategy is a first step toward a prosthesis-integrated sensing system that could be used to collect, process, and convey information of interest to users, practitioners, and researchers. In this study, we used commercially available accelerometers and a custom software algorithm to classify the movements and body postures of persons with transtibial amputation. 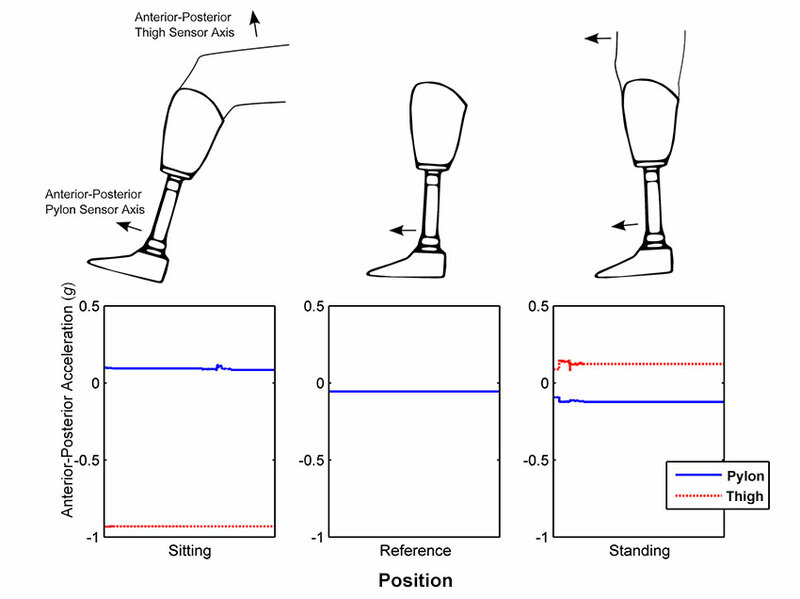 Our hypothesis was that data from a single prosthesis-mounted accelerometer could be used to identify when a prosthetic user was wearing the prosthesis and whether the user was sitting, standing, or actively moving. An algorithm was designed to identify when the prosthesis was being worn and to classify actions as movement (i.e., regular leg motion such as walking or stair climbing, transitioning from one posture to another, or donning or doffing the prosthesis), standing, or sitting. Persons with transtibial amputations were recruited to test the developed classification algorithm in a semicontrolled activity protocol. All subjects were recruited from local prosthetic clinics, peer-support groups, and hospitals. Inclusion criteria were ages 18 to 75, transtibial amputation that occurred at least 2 yr prior to testing, Medicare Functional Classification Level (MFCL) 2 (limited community ambulator) or higher , a healthy residual limb with intact skin, and ability to walk for at least 1 h (with rests as necessary). ActiLife ActiGraph GT3X+ accelerometers (Pensacola, Florida) were applied to each subject to measure limb segment accelerations. The GT3X+ has a ±6 g (gravitational acceleration) dynamic range, 0.00293 g resolution, 100 Hz maximum sampling rate, up to 31 d of battery life, and up to 40 d of data storage. A dynamic range of ±6 g has previously been found to be acceptable for quantifying movement patterns during walking [30–31]. The ActiGraph accelerometer is packaged in a 4.6 ?? 3.3 ?? 1.5 cm water-resistant enclosure and weighs 19 g. One accelerometer was attached to the subject's prosthesis, proximal to the foot. Positioning the accelerometer at this location, instead of a more proximal one, ensured the sensor was subjected to high accelerations (i.e., received a strong signal) during leg motions. The sensor was oriented with the positive x-axis along the limb axis and the positive z-axis in the medial-lateral direction (Figure 1). A second accelerometer was affixed to the anterior thigh on the same leg as the prosthesis. It was oriented with the positive x-axis along the limb axis and the positive y-axis facing to the subject's right. These locations ensured that different postures would be easily differentiated using anterior-posterior acceleration data. A sheet of Tegaderm (3M; St. Paul, Minnesota) was placed on the skin of the thigh. Adhesive-backed Velcro was then used to attach the accelerometer to the Tegaderm (Figure 1). The second accelerometer was further secured with an elastic strap to minimize local movements. Sampling rates for both accelerometers were 40 Hz. A 40 Hz sampling rate was deemed acceptable as most of the energy in gait is concentrated below the resulting Nyquist frequency of 20 Hz [32–33]. A sampling rate of 40 Hz rather than a higher rate typically used in gait laboratories maximized the duration of data collection and still allowed for the identification of relevant gait events. At this sampling rate, GT3X+ accelerometers are capable of recording data for up to 30 d.
Accelerometer attachments and orientations. One accelerometer was connected securely to subject's pylon with z-axis facing in medial-lateral direction and x-axis facing in long direction. Second accelerometer was attached securely to subject's thigh with y-axis facing to right and z-axis facing in anterior-posterior direction. Two experiments were performed to assess the accuracy of a novel algorithm designed to classify use of prostheses as (1) movement (e.g., walking, using stairs, or transitioning from one posture to another), (2) standing (i.e., upright standing posture with minimal movement), (3) sitting (i.e., seated posture with minimal movement), or (4) doffed (i.e., prosthesis not being worn) based on data from the pylon-mounted accelerometer. The thigh-mounted accelerometer was used in both experiments to enhance accuracy of activity and posture recognition so as to validate classifications derived by an algorithm run only on the single accelerometer data. Two algorithms were developed to classify movement, posture, and wear. One algorithm made use of data from the pylon-mounted accelerometer only, and the other algorithm made use of data from both accelerometers. The purpose of the first experiment was to assess the accuracy of single- and dual-accelerometer classifications of activities performed in a laboratory setting compared with visual observation. Subjects were asked to perform a predefined activity protocol that included walking over level ground (i.e., an indoor hallway); sitting on office chairs, sofas, or benches; standing; ascending and descending stairs; and doffing and donning the prosthesis. These activities were deemed to be most representative of the activities of clinical interest to prosthetists. Subjects were asked to sit in each type of seat at least three times, stand and walk the hallway at least five times, use the stairs at least once, and doff/don their prosthesis once. Each time the subject performed an activity in the test sequence, he or she was asked to perform it for at least 60 s. Subjects were asked to perform the sequence in a set order, but were asked to engage in each activity, posture, or don/doffing action as they normally would (i.e., no instructions were given for walking speed, sitting posture, etc.). Subjects were visually monitored while they performed the test sequence. A researcher followed and timed each subject with a stopwatch to capture when subjects started and stopped each type of movement, posture, or don/doffing action. This record was used for ground-truth comparisons. The purpose of the second experiment was to assess differences between single- and dual-accelerometer classifications of activities performed in free-living settings. In the second experiment, two subjects were asked to wear both accelerometers for 2 d outside of the laboratory. Subjects were asked to go about their days normally. When they doffed their prosthesis, they were to remove the thigh-mounted accelerometer and set it on a flat surface. Use of Velcro and an elastic band for accelerometer attachment allowed the subject to easily reattach the thigh-mounted accelerometer. Raw acceleration data, such as those shown in Figure 2, obtained from the GT3X+ accelerometers were postprocessed using custom algorithms written in MATLAB, ? ?version 7.12.0, software (MathWorks Inc; Natick, Massachusetts). No filtering was performed on the data. Data were buffered into short windows with an overlap of 50 percent. Window length was experimentally determined as described here and set to 45 samples (i.e., 1.125 s). Plots of (a) signal magnitude area (SMA) and (b) pylon acceleration signals for different activities and postures. If SMA was higher than upper threshold, subject was considered engaged in movement. If SMA was between thresholds, subject was considered stationary. If SMA was below lower threshold for more than 320 s, prosthesis was considered doffed. Plot shows SMA in decibels to accurately show difference between thresholds. Lower threshold, set to 0.01 g, corresponds to –40 dB and upper threshold of 0.1 gcorresponds to –20 dB. A binary decision tree (BDT) algorithm  was designed to classify the windowed data. Data from all three axes of the pylon-mounted accelerometer were used to determine whether the subject was active, was stationary (i.e., sitting or standing), or had doffed the prosthesis. Determination of posture was performed using only the anterior-posterior data of one accelerometer. For the algorithm that used data from only the pylon-mounted accelerometer, data from the anterior-posterior axis of that accelerometer was used. For the algorithm that used data from both accelerometers, data from the anterior-posterior axis of the thigh-mounted accelerometer was used. where X(t), Y(t), and Z(t) are the acceleration readings at time (t) for each axis X, Y, and Z. The developed algorithm required several subject-specific parameters for calibration. First, the accelerometers– locations (i.e., left or right leg) were required to correctly orient the pylon-mounted accelerometer's anterior-posterior axis; the axial direction did not change, and the y-axis of the accelerometer rotated with leg change to remain pointing in the lateral direction. Second, the pylon accelerometer's inclination while the prosthesis was doffed and standing upright with the foot on the floor was required. This doffed position served as a reference to differentiate sitting and standing postures. This strategy was effective because the anterior-posterior inclination angle (with respect to the vertical axis) was found to be greater than the doffed reference angle for sitting and less for standing (Figure 4). 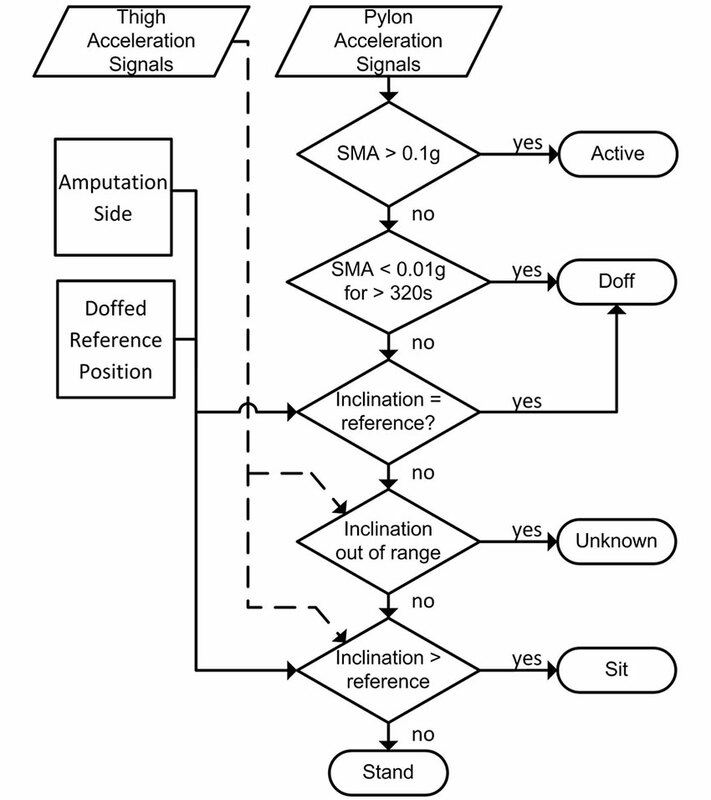 Binary decision tree algorithm used for activity and posture classification. Thigh acceleration signals (dashed line) were considered only in cases where two accelerometers were used. 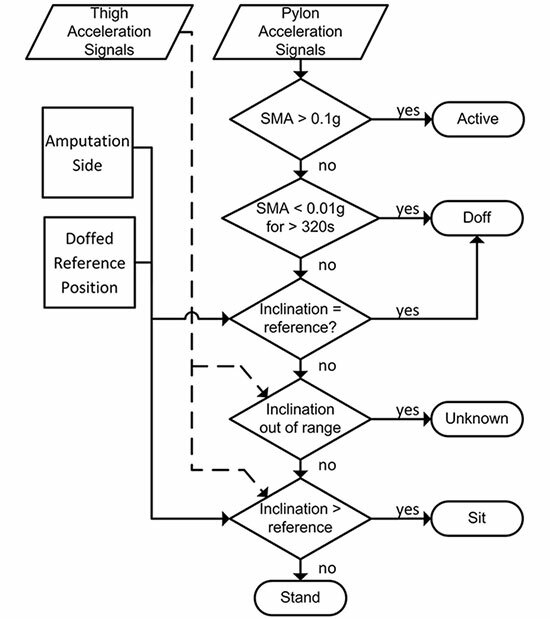 SMA = signal magnitude area. Pylon and thigh acceleration signals over 60 s period when subject was sitting, had doffed prosthesis and placed foot flat on floor in reference position, or was standing. Two activity thresholds were used to guide classifications. The lower and upper activity thresholds were experimentally determined via a sensitivity analysis using the laboratory-based experiment data as described here. These thresholds were set to 0.01 g and 0.1 g, respectively (Figure 2). When SMA was below the lower threshold, the subject was deemed either to be stationary or to have doffed his or her prosthesis. When SMA remained below the lower threshold for more than 320 s, the prosthesis was considered doffed. The 320 s parameter was chosen based on the observation that subjects in stationary postures during the first experiment were not completely immobile for the full length of time they were in the posture, but further research will be needed to validate it. Otherwise, the prosthesis was assumed to be donned and windows were classified as a stationary posture (i.e., standing or sitting). When SMA was between the lower and upper thresholds, the accelerometer data from that window were averaged to find the inclination . Inclination was then compared to the subject's reference inclination to determine whether the subject was sitting, was standing, or had doffed the prosthesis (Figure 2). If the prosthesis was oriented in a way that did not correspond to one of those postures, indicated by the inclination being outside of a range that could be obtained by a sitting or standing individual, the window was classified as unknown. Lastly, when SMA exceeded the upper threshold, the subject was considered to be engaged in movement. When data from only the pylon-mounted accelerometer were used for classification, sitting or standing was calculated based on the inclination of the prosthesis as determined by anterior-posterior accelerometer measurements. 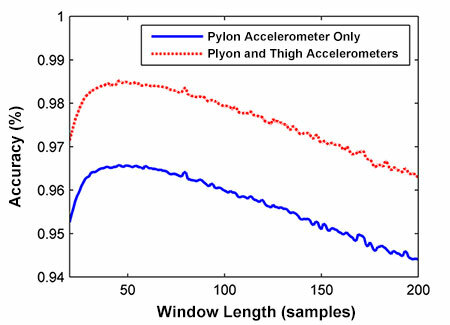 When data from both the pylon-mounted accelerometer and the thigh-mounted accelerometer were used for classification, the pylon-mounted accelerometer data were used to determine movement, and data from the anterior-posterior axis of the thigh-mounted accelerometer were used to determine posture (Figure 4). A sensitivity analysis was performed on the three experimentally determined parameters of the classification algorithm. Window size, upper activity threshold, and lower activity threshold were varied to determine the optimal values described previously and to assess the sensitivity of the results to changes in those parameters. Classification accuracy for each experiment was calculated by comparing (on a window-by-window basis) the predicted activity or body posture to that which was recorded by the researcher during the experiment. The accuracy was computed as the ratio of the number of correctly classified windows to the total number of windows that were evaluated. Accuracy was calculated for both single- and dual-accelerometer classification algorithms. Confusion matrices, a method of describing which postures and activities were misclassified and as what posture or activity they were misclassified, were calculated for each subject . A mean confusion matrix was also calculated using classifications from all subjects. For the second experiment, accuracy in differentiating sit and stand postures and activities was quantified by comparing the prediction of the BDT algorithm using only data from the pylon-mounted accelerometer to that from both accelerometers. Eight subjects (six male and two female) were recruited to participate in the first (i.e., laboratory-based test sequence) experiment and two subjects (both male) were recruited to participate in the second (i.e., multiple day validation) experiment (Table 1). All subjects had a unilateral transtibial amputation. Subjects– mean ± standard deviation (SD) age was 53.0 ± 11.6 yr, weight was 90.4 ± 11.6 kg, height was 178.0 ± 7.2 cm, and time since amputation was 19.6 ± 13.9 yr. Subjects were classified as MFCL-2 (n = 3), MFCL-3 (n = 3), or MFCL-4 (n = 4) by the study prosthetist based on interview and clinical evaluation. F = female, L = left, M = male, MFCL = Medicare Functional Classification Level, R = right, SD = standard deviation. Window lengths from 20 to 80 samples were tested to determine the effect of window length on classification accuracy. The sensitivity of both classification algorithms to window length was similar. Both algorithms had a maximum classification accuracy at approximately 45 samples per window (Figure 5). Sensitivity of classification accuracy to window length. Classification accuracy reached maximum at 45 samples per window for both algorithms that were tested. Accuracies for classifications derived using lower activity thresholds between 0.001 and 0.02 g and upper activity thresholds between 0.01 and 0.2 g were computed. It was found that if the activity thresholds were low, accuracy decreased substantially because stationary postures (e.g., standing or sitting) were classified as active use (Figure 6). As thresholds increased from their optimal value, accuracy dropped off because of periods of activity being misclassified as sitting, standing, or doffed. Maximum accuracy was achieved for the pylon data classification algorithm using a 0.01 g lower threshold and a 0.1 g upper threshold. Maximum accuracy was achieved for the pylon and thigh data classification algorithm using a 0.008 g lower threshold and a 0.1 g upper threshold. These optimal thresholds were used in all subsequent analyses. Sensitivity of classification accuracy to activity thresholds. Classification accuracy reached maximum when lower threshold was 0.01 g and upper threshold was 0.1 g. Accuracy decreases significantly if lower thresholds are chosen, but higher thresholds result in smaller losses in accuracy. In experiment 1, overall classification accuracy for each subject ranged from 90.1 percent to 99.6 percent when using data from only the pylon-mounted accelerometer (Table 2). Mean ± SD classification accuracy was 96.6 ± 3.0 percent. The most commonly misclassified body posture was sitting, which was typically misclassified as standing. The confusion matrix shows the percentage of actions that were classified correctly or misclassified as other activities (Table 3). Classification accuracies for all subjects during the laboratory-based test sequence. Subject accuracies ranged from 90 to 99 percent. The algorithm that used data from both accelerometers had classification accuracy equal to or better than the algorithm that used only data from the pylon-mounted accelerometer. Mean ± SD classification accuracy using both accelerometers was 98.5 ± 2.5 percent, 1.9 percent greater than that obtained using a single accelerometer (Table 2). In experiment 2, mean ± SD agreement between classification with one and both accelerometers was 90.3 ± 5.2 percent. Classification of activities for one subject (Subject 9) was 84.7 percent, while for the other subject (Subject 10) it was 95.8 percent. Confusion matrix for activities in first experiment shows that there were few unclassifiable activities when using only pylon-mounted monitor. Most commonly misclassified activities were sit and stand. Rows of confusion matrix represent visually identified activity or posture. Columns represent classifications generated by binary decision tree algorithm. We demonstrated that a prosthesis-mounted ActiLife ActiGraph GT3X+ three-axis accelerometer can be used to identify the postures and movement of persons with transtibial amputation. We also showed that differentiation of sit and stand postures is possible using knowledge of the prosthesis doffed with the foot flat on the floor. A custom algorithm classified data gathered from users as they performed actions in a free-living situation. In a ? ?laboratory-based experiment, use of a pylon-mounted accelerometer alone or in conjunction with a thigh-mounted accelerometer allowed for classification of movement and posture with accuracy equal to or greater than 90.1 percent, which may be deemed acceptable for clinical and/or scientific applications. Although the developed algorithm accurately classified movements and postures in general (Table 2), it was challenged in select situations. For example, the algorithm commonly misclassified sitting as standing when subjects were seated on a high bench. Although sitting accuracy was above 98.2 percent for low chairs, subjects often oriented their prosthesis at a right angle to the ground in higher chairs rather than extending their prosthetic leg forward as they did in a lower seat. As such, standing may be overestimated (and sitting underestimated) if users sit with their knees flexed at 90 degrees. Use of a second accelerometer may eliminate this issue, but may introduce other problems, such as compliance or improper attachment and removal. It may be possible to reduce the number of single-accelerometer misclassifications by using a probabilistic model to account for transitions between activities. The classification algorithm achieved a comparatively low accuracy of 90.1 percent for one test subject in experiment 1. This subject wore a brace on her contralateral limb, which may have been a factor in the observed low classification accuracy. Further research may be required to investigate the effects of braces and other walking aids (e.g., canes and walkers) on the classification algorithm. This movement and posture classification algorithm was capable of identifying the specified behaviors with accuracies of 94.0 percent with only a single accelerometer for all but one prosthesis user (Table 2). It also appears that using a second accelerometer may not be necessary for accurate classification, as it increased classification accuracy by an average of only about 1.9 percent during the laboratory-based experiment. Agreement between single- and dual-accelerometer classification in the second (free living) experiment was 84.7 to 95.8 percent. The large difference in results between the two subjects is most likely due to the subjects standing or sitting in different ways, but more research must be done to investigate. This activity monitoring method may therefore avoid the need for multiple monitors as used in other studies [18,23,27,36]. The developed system appears to meet or exceed classification accuracies reported in related ? ?studies on nondisabled and elderly populations [17–18,23,36]. Our system also used fewer sensors than other systems [14,19,36]. Our classification system is designed to detect sitting and standing postures as well as movement, unlike monitors such as the StepWatch3 (Orthocare Innovations, Mountlake Terrace, Washington) and the Patient Activity Monitor (? ?ssur; Reykjavik, Iceland) . Additional research is needed before this classification strategy can be recommended for clinical use. The system must be validated more thoroughly while prosthesis users move through their free-living environments. The choice of classification parameters, including the upper and lower SMA thresholds and the 320 s stationary period, must also be validated. One potential limitation in use of the developed posture and activity classification strategy is the unknown effect of riding in a motorized vehicle. Further research is required to isolate or account for external accelerations to which a user may be subjected while riding in vehicles. Additionally, postures (e.g., lying down) or specific activities (e.g., stair climbing) of interest to researchers should be explored to ensure they can be appropriately classified with this system. Clinical uses of this technology (e.g., rehabilitation training, componentry evaluation) should be explored to determine whether the accuracy of which this system is capable is sufficient for such applications. The long battery life and large storage capacity of the ActiGraph GT3X+ accelerometer suggest that this sensor may be suitable for long-term data collection. Anticipated advances in battery and storage technologies will also likely extend the length of time such sensors can be used to monitor subjects. Such research will help to determine whether prosthesis-integrated monitoring systems can enhance clinical care and improve quality of life for prosthesis users. A classification algorithm was developed to identify periods of prosthesis use and to discriminate activities and body postures of individuals with a lower-limb amputation. Periods of movement, standing, sitting, or a doffed prosthesis were accurately classified in a laboratory-based experiment more than 92.0 percent of the time when using data from two body-mounted accelerometers and more than 90.1 percent of the time when using data from a single accelerometer. These data suggest that activities and body postures can be well classified using this classification algorithm and data from a single, commercially available accelerometer. More research is required to validate the system in situations where the activity duration and type are not controlled. We believe that the information derived from this system will provide valuable clinical insight into how persons with transtibial amputation use their prostheses in their free-living environments and that such evidence can be used to facilitate prosthetic treatment and rehabilitation of persons with limb loss. It may also be useful for automatic feedback control to adjust prosthesis mechanisms based on activity and posture. Study concept and design: M. T. Redfield, J. C. Cagle, B. J. Hafner, J. E. Sanders. Acquisition of data: M. T. Redfield, J. C. Cagle. Analysis and interpretation of data: M. T. Redfield, J. C. Cagle, B. J. Hafner. Drafting of manuscript: M. T. Redfield, B. J. Hafner. Critical revision of manuscript for important intellectual content: J. C. Cagle, B. J. Hafner, J. E. Sanders. Statistical analysis: M. T. Redfield, B. J. Hafner. Obtained funding: M. T. Redfield, B. J. Hafner, J. E. Sanders. Funding/Support: This material was based on work supported by the National Science Foundation (grant EEC-1028725) and the National Institutes of Health (grant 1R01HD069387). Institutional Review: Subjects provided informed consent prior to participation. All procedures were approved by a University of Washington Institutional Review Board before study procedures were initiated. Additional Contributions: The authors would like to acknowledge Kate Allyn for her assistance with data collection. Disclaimer: The content is solely the responsibility of the authors and does not necessarily represent the official views of the National Science Foundation or the National Institutes of Health. Condie E, Scott H, Treweek S. Lower limb prosthetic outcome measures: a review of the literature 1995 to 2005. J Prosthet Orthot. 2006;18(6):13–45. Schoppen T, Boonstra A, Groothoff JW, de Vries J, G? ?eken LN, Eisma WH. The timed –up and go– test: Reliability and validity in persons with unilateral lower limb amputation. Arch Phys Med Rehabil. 1999;80(7):825–28. Stepien JM, Cavenett S, Taylor L, Crotty M. Activity levels among lower-limb amputees: Self-report versus step activity monitor. Arch Phys Med Rehabil. 2007;88(7):896–900. Ramstrand N, Nilsson KA. Validation of a patient activity monitor to quantify ambulatory activity in an amputee population. Prosthet Orthot Int. 2007;31(2):157–66. Chou TG, Webster JB, Shahrebani M, Roberts TL, Bloebaum RD. Characterization of step count accuracy of actigraph activity monitor in persons with lower limb amputation. J Prosthet Orthot. 2009;21(4):208–14. Frossard L, Stevenson N, Sullivan J, Uden M, Pearcy M. Categorization of activities of daily living of lower limb amputees during short-term use of a portable kinetic recording system: A preliminary study. J Prosthet Orthot. 2011;23(1):2–11. Lester J, Choudhury T, Kern N, Borriello G, Hannaford B. A hybrid discriminative/generative approach for modeling human activities [abstract]. In: Leslie Pack Kaelbling AS, editor. 19th International Joint Conference on Artificial Intelligence; 2005 Jul 30–Aug 5; Edinburgh, Scotland, UK. Menlo Park (CA): International Joint Conferences on Artificial Intelligence; 2005. p. 766–72. Atallah L, Aziz O, Lo B, Yang G. Detecting walking gait impairment with an ear-worn sensor. 6th International Workshop on Wearable and Implantable Body Sensor Networks; 2009 Jun 3–5; Berkeley, CA. Piscataway (NJ): IEEE; 2009. p. 175–80. Selles RW, Formanoy MA, Bussmann JB, Janssens PJ, Stam HJ. Automated estimation of initial and terminal contact timing using accelerometers; development and validation in transtibial amputees and controls. IEEE Trans Neural Syst Rehabil Eng. 2005;13(1):81–88. Bussmann HB, Reuvekamp PJ, Veltink PH, Martens WL, Stam HJ. Validity and reliability of measurements obtained with an –activity monitor– in people with and without a transtibial amputation. Phys Ther. 1998;78(9):989–98. Ooi S, Osman N. Ambulatory function monitor for amputees. In: Osman NA, Wahab AK, Abas IW, Ting H, editors. 5th Kuala Lumpur International Conference on Biomedical Engineering 2011–BIOMED 2011: IFMBE Proceedings; 2011 Jun 20–23; Kuala Lumpur, Malaysia. New York (NY): Springer; 2011. p. 732–34. Administrators CG. Jurisdiction C supplier manual. Nashville (TN): CGS; 2011. p. 4–5. Ledoux WR, Hillstrom HJ. Acceleration of the calcaneus at heel strike in neutrally aligned and pes planus feet. Clin Biomech (Bristol, Avon). 2001;16(7):608–13. Kwapisz J, Weiss G, Moore S. Activity recognition using cell phone accelerometers. Explorations. 2011;12(2):74–82. Schuldt C, Laptev I, Caputo B. Recognizing human actions: A local SVM approach. 17th International Conference on Pattern Recognition: Pattern Recognition 2004, Volume 3; 2004 Aug 23–26; Cambridge, UK. Piscataway (NJ): IEEE; 2004. p. 32–36. Najafi B, Aminian K, Loew F. An ambulatory system for physical activity monitoring in elderly. 1st Annual International IEEE-EMBS Special Topic Conference on Microtechnologies in Medicine and Biology; 2000 Oct 12–14; Lyon, France. Piscataway (NJ): IEEE; 2000. p. 562–66. Submitted for publication December 21, 2012. Accepted in revised form April 10, 2013. Redfield MT, Cagle JC, Hafner BJ, Sanders JE. Classifying prosthetic use via accelerometry in persons with transtibial amputations. J Rehabil Res Dev. 2013;50(9): 1201–12.